Welcome to the world of Penny Black! She is no ordinary girl. You are about to enter a world like no other, from a seasoned novelist writing a new series under a new pen name. Over the opening eight episodes of season one (think of it like you would a television show on a subscription service) you will be immersed in the life of young Penny Black, named by her stamp-collecting father, though that was about as much as he had to do with her. Yet, we learn, they could have been so much more to her than the train-wreck of parenting they were. Designed to be able to digest each book in a single sitting, or a day's commute, you'll keep coming back again and again to a series which, as you'll soon see, keeps on giving. There is so much more you'll want to know, and so much more excitement, twists and revelations to come. ★★★★★ Interesting read from the very start as the author takes you down the path of Penny’s inner thoughts. Lays bare the human nature very well and in an unusual read. Not my normal genre but found it to be a great read. TH Paul through the voice of Penny herself and the narrator take us deep into the mind of an adolescent girl awakening to a power that is a true double-edged sword–a gift and a curse. The author paints clear pictures of her, her life, and those around her. At one moment we emphasize with her and the next we are appalled at her behaviour. ★★★★★ The story arc covers a number of years. It is complete and gives closure, but still, leaves you wanting to know more about Penny Black. ★★★★★ I found this very entertaining and starting reading the second volume in the series as soon as it was available. The book is quite different from previous ones by the same author (under the real name). In some respects, it is like reading a different author except for the ability to paint a vivid picture with the written words. ★★★★★ This is a great novella. Once I started I had to keep on going until the end. I adore Penny Black. She is so completely flawed that she becomes extremely endearing, despite having a dark side. Loved the way that Nothing goes as planned too. Some interesting moral dilemmas and a challenging look at the issue of revenge. The inconclusive end means I have to read the next one … soon! 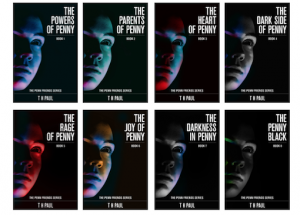 ★★★★★ T H Paul continues the sage of Penny and her powers. While the premise is about the powers that Penny has it is really exploring the thoughts and actions of this teenage girl as she works through the typical issues that confront teens. With her powers, she comes up with some atypical solutions. Good fast read! I recommend that you read all the books in order so you can fully understand all that is happening in the story. The saga of Penny Black continues…even better than before – still limited by Amazon to only 5 Stars but obviously the best-buy! These titles are FREE to read for Kindle Unlimited subscribers (click the link for a 30-day FREE trial). The adventure continues with Season Two. It's titled A Boy Lost because it focuses on Jack, but it is the follow-on, oh-so-clever series that I'm sure will surprise you and leave you on the edge of your seat!